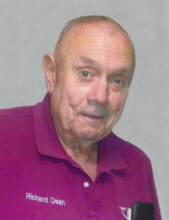 Mr. Richard “Grampy” Dean, 71 of Green Hill, passed from this life on Friday, February 8, 2019 at the Compassionate Care Center in Richmond. He was born in Berea, KY on July 5, 1947 the son of Harold Dean and Francis Ray, and was raised by his “Mommie and Daddie”, Leonard and Georgia Alexander. He was a retired truck driver and a US Army veteran of the Vietnam War. He was a member of Brodhead Masonic Lodge and was heavily involved in local volunteer fire department and law enforcement. He loved riding his motorcycle, old cars, spending time with his buddies at the truck stop, and being with his granddaughters. He is survived by his loving wife of 32 years, Donna Durham Dean; a step-daughter, Jacki Johnson and husband Troy; and his granddaughters, Alycia Marie and Brittany Ann. He was preceded in death by a son, Edward Lee Dean; his grandparents, Leonard and Georgia Alexander; and his parents, Harold Dean and Francis Ray. To plant a tree in memory of Richard Dean, please visit our Tribute Store. "Email Address" would like to share the life celebration of Richard Dean. Click on the "link" to go to share a favorite memory or leave a condolence message for the family.